The new donation marks a shift in Thiel’s method of supporting the Republican nominee; before yesterday, he had publicly endorsed but never actually bankrolled Trump’s campaign. In late August, a spokesperson for Thiel told the Wall Street Journal that he had no plans to donate any money to the campaign or a pro-Trump political action committee. The new injection of cash also suggests Thiel regards Trump’s growing number of sexual harassment scandals as little more than a distraction. 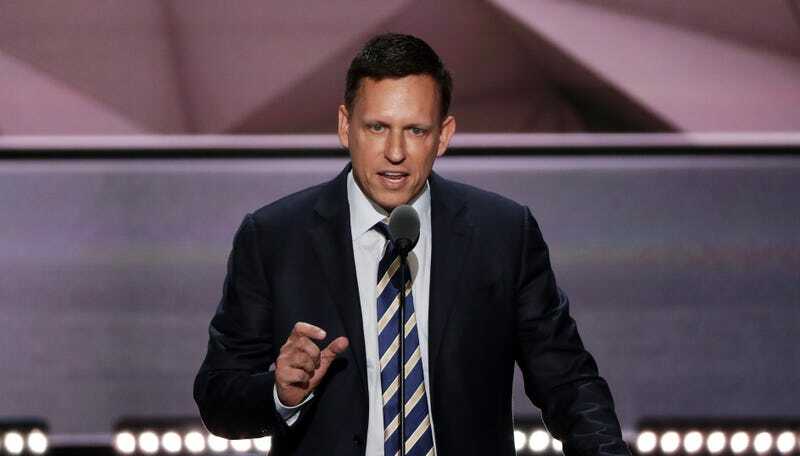 “Thiel ... apparently is unfazed by the storm around the candidate in the last week following the broadcasting of lewd conversations recorded by the syndicated program Access Hollywood,” the Times reported. This suggests, of course, that Thiel is more than willing to tolerate Trump’s behavior toward women—such as bragging about groping them without consent, branding his accusers as liars, and sliming the reporters who cover the accusations. (“Reporters at the New York Times, they’re not journalists,” Trump told supporters in North Carolina. “They’re corporate lobbyists for Carlos Slim and for Hillary Clinton.”) Then again, Thiel’s own politics may have inspired some sympathy for Trump’s predicament. In a 2009 essay, Thiel observed that women’s suffrage was incompatible with capitalist democracy. In the world of political fundraising, $1.25 million is not exactly a game-changing sum, and will do little to reverse Hillary Clinton’s overwhelming financial advantage over her opponent. And while Thiel has much more than $1.25 million to dole out—his net worth hovers around $2.7 billion—he also has other things to spend his money on, like seasteading or experimental blood transfusions. Compared to his other hobbies, Donald Trump’s campaign seems like a rather small concern. For example: To put Gawker Media out of business, Forbes reported earlier this year, Thiel spent somewhere around $10 million.